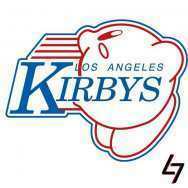 I'll take it one step further: I predict they're going to have at least one #1 overall pick by 1993. I'm going with Ghosts and Captains in the Wild Card. Guarantee that 3 of the other 4 Northeast division teams will be in the top 7 in the 93 draft. After a battle for field position throughout the first 15 minutes, Boston finally advanced deep into Philadelphia territory in the waning seconds of the opening quarter. They pushed to the one, but the defense held strong, stuffing three consecutive rushing attempts, and the field goal unit took the field. K Chris Pelino was halfway to his position when he realized that he had forgotten his helmet, and sprinted back to the sideline to retrieve it. As he ran back out onto the field, P Rhys Scott, who served as the holder, took the snap. The trick play worked, and Scott easily slipped into the end zone, having caught the Railers napping. The Captains would never relinquish the lead. A pair of lost fumbles by former Imperial RB Markus Warner cost Philadelphia dearly in the second quarter, with the first coming at the Boston 33 and the second at their own 7, which set up a Russell Fraizer touchdown run to put Boston up 14-0. Fraizer would add another TD late in the third to extend the lead to 21. The Railers attempted a comeback, finally getting on the board with a touchdown pass from John LeBell to WR Vinny Eagle with 6:11 left to play, but it was too little, too late. The Captains won a solid victory, earning their second consecutive trip to the quarterfinals. Prognosticators said that the only way that Cleveland would be able to come away with a win would be to establish an early lead, and use their rushing attack to run out the clock. They were able to accomplish the first part of the plan, getting on the board first with a 7 yard touchdown run by the elusive James McCoy. Then, in the final minute of the opening quarter, they appeared to be on the verge of making it a two-score game when QB Sam Mundy was sacked at the Detroit 32, and coughed up the ball. Detroit seized the momentum after the turnover, tying the game five minutes later on a 15 yard pass from John Lewis to WR Ray Carroll. They would go on to take their first lead of the day 3 minutes before the half when the speedy WR Angelo Caro burned the defense for a 40-yard touchdown strike. The Detroit defense piled it on early in the third when CB Ron Pryce grabbed the ball after it had been tipped by WR Bob League, and made two guys miss as he took it to the house for a 53-yard touchdown. 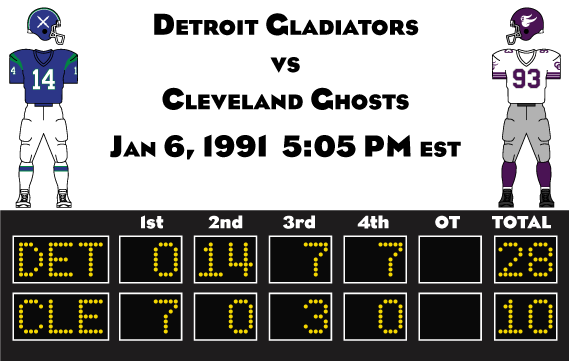 Cleveland managed to staunch the bleeding with a field goal late in the third, but a 2 yard swing pass to All-Star RB Johnny Hewitt gave Detroit a 28-10 advantage with 11 minutes to play, and the Gladiators coasted to the win. This game will be a lopsided mess. The Guardians championship window may be closing, but their roster is full of living legends – they likely have somewhere between 3-5 future hall of famers on the team. Seattle has… Greg Benham, a draft bust who has already failed to make an impact in Kansas City and California. The Guardians crush the Grizzlies 35-10. All eyes will be on the matchup between Tampa WR Deacon Cross and Colorado CB Vic Ferrer. Generally speaking, the Bobcats have forced opposing defenses to pick their poison – stack the box to try to stop RB Wayne Lee, keep Cross in double coverage all day, or do both at let QB Bobby Davis pick apart the rest of the defense. The difference this week is that Ferrer is a true shutdown corner, and may be one of the few men in the league who can survive on an island with Cross. Tampa may have more young star power, but the Cents are the better-rounded team, and that will carry them to victory. Colorado wins, 27-24. This game could be an instant classic as one of the league’s most heated rivalries meet in January. New York QB Ron Adams will turn 39 this offseason, and doesn’t have a lot of gas left in the tank. Both teams will use this as motivation, as the Imperials try to get their leader an elusive ring while the Captains look to deny that dream to a player who has been beating up on them since 1976. On paper, New York is probably the better team, but they are entering the postseason after an extremely rough December, while Boston is coming in hot. The Captains pull off the upset, 21-20. This has blossomed into one of the best rivalries in the league (most fans wanted to see a Houston-Detroit Victory Bowl a year ago). Both teams could make a case for having the best set of “triplets” in the league. Detroit has won back-to-back Victory Bowls behind the trio of QB John Lewis, RB Johnny Hewitt, and WR Angelo Caro. Houston, meanwhile, has the best QB in the league in Tom Hudson, an absolute bulldozer in RB David Kennedy, and one of the league’s most exciting speedsters in WR Mark Ellison. Both teams also boast deep, talented defensive units. This game could go either way, but Detroit has generally gotten the better of Houston in recent years, and that trend will continue. Detroit wins 30-24. Gotta love how Philly has players named LeBell and Eagle. Crossing my fingers for an Imperials-Guardians Victory Bowl this time around! That actually never occurred to me. I can’t believe I never noticed it. Go Bobcats. Eat through the 1-year wonder Cents and leap back to the Victory Bowl. The graphic seems to have some issues, namely not being updated and having the incorrect Roman numeral "XVL". Crap. Thanks for pointing it out. I could have sworn that this was the first place I fixed it when I corrected the master version. I’ll update it next time I’m at my computer. It’s a twist on a play I saw the Colts run once. Manning started walking toward the sideline as though he had called a timeout, and they snapped it directly the RB. If I remember right, it was a TD for Edgerrin James. 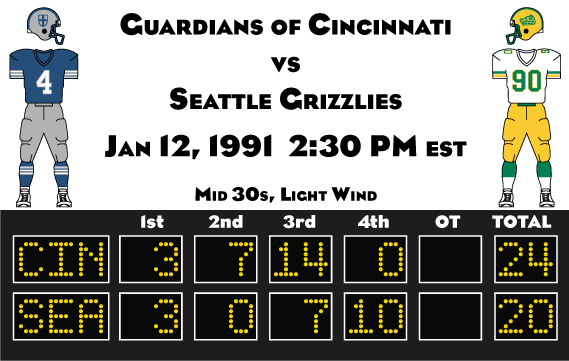 The first 40 minutes of this game went much as expected, with the Guardians dominating the Grizzlies. When Reggie Hart connected with WR Chris Kramer for his second touchdown of the day with 9:23 on the clock in the third quarter, it gave Cincinnati a 24-3 lead, and the game appeared to be all but over. When the Seattle offense came onto the field, they were led not by veteran QB Greg Benham (who was 3-17 for 27 yards and 2 turnovers), but by a second-year pro out of Mississippi, Darrel Barnett. After a difficult first drive, the Grizzlies suddenly came to life. With 1:37 remaining in the third quarter, Barnett hit WR James Arwood down the sideline for a 22 yard touchdown, putting the score at 24-10. An errant throw by Reggie Hart was picked off in Guardian territory midway through the fourth, and the Grizzlies took advantage, making it a one-score game as RB Chuck Keil burst into the end zone from the 1 yard line 90 seconds later. After forcing a punt, Seattle again pushed into enemy territory, but ultimately had to settle for a field goal, cutting the deficit to 24-20 with 4:15 to play. Seattle would get the ball back with 2:03 to play at their own 17 yard line. Barnett drove down the field with a series of quick passes underneath the defense. Eventually, the Grizzlies advanced all the way to the Cincinnati 1. After failing to get into the end zone three times, they were faced with fourth and goal with 13 seconds on the clock. Barnett handed the ball to Keil, who attempted to seal the game, but the Cincinnati defense read the play and stopped him inches short of the goal line. Reggie Hart didn’t even have enough space to do a kneel down, and instead had to run what was essentially a quarterback sneak to run down the final 9 seconds of the game. They may have come within inches of falling to an 8-8 team, but the Guardians are back in the semifinals for the fourth time in six years. As was the case in the first game of the day, only one of the two starting quarterbacks would play all four quarters. However, while switching from Greg Benham to Darell Barnett allowed Seattle to get back into the game, Colorado’s switch from Rod Crichton to rookie Ray Beck would ensure that they never got into it in the first place. Crichton’s day ended just five minutes into the game when he was flushed out of the pocket and scrambled to his right. He would run for three yards on the play, but was caught from behind by RE Steven Perdue, who grabbed the quarterback by the collar and pulled him down, tearing the quarterback’s ACL. Horse collar tackles were perfectly legal at the time, so Perdue was not flagged, but the play infuriated the Colorado sideline, and several scuffles would break out throughout the course of the game. Unfortunately, the Cents were unable to turn that anger into productivity. 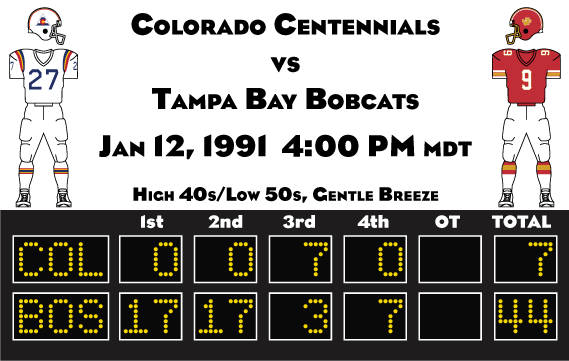 The Bobcats were already ahead 7-0 when Crichton went down, and they would put up an additional 30 points before Colorado finally got on the board late in the third quarter when Beck found WR Tom Peterson for his first career touchdown pass. It would make no difference however, as the 37-7 game would become 44-7 just ten minutes later when Beck threw another pass resulting in a touchdown… for the wrong team. He was hit as he threw, which allowed CB Greg Fox to easily pick the ball off and take it 17 yards to the end zone. As for the highly anticipated battle between Tampa WR Deacon Cross and Colorado CB Vic Ferrer – Cross was the obvious winner. Ferrer did hold his assignment to 4 receptions for the day, but those catches were good for 99 yards and 3 touchdowns (including a 63-yarder on the second play after halftime). The game got off to a sloppy start for both sides. Less than five minutes into the game, New York’s Ron Adams badly overthrew WR Avery Gonzalez and was picked off by FS Jim Hubbard, allowing Boston to start a drive at the Imperial 32. However, they were unable to take advantage of the situation as QB Jon Cliffe made a wild throw of his own, which was intercepted in the end zone by CB Rick Roudebush for a touchback. New York’s offense retook the field, but on their very first play C Carlos Plano snapped the ball hard and low to Adams in the shotgun formation. The ball hit Adams in the shin, and rolled back toward the line of scrimmage. Both teams dove on top of it, and when the pile was cleared, Boston LB Stan Outwood came up with possession. After three turnovers in under 2 minutes, Boston finally got on the board, by taking the ball out of Cliffe’s hands and giving it to star RB Russell Fraizer, who needed only two carries to cover the 16 yards to the end zone. The Captains would extend their lead to 14-0 on a Cliffe QB sneak late in the first, though the Imperials were able to cut the deficit to 11 with a field goal in the final minute of the quarter, and that score would last for the remainder of the half – New York did threaten to score early in the second quarter, but Adams telegraphed a screen pass, which was picked off by LB Mike Pankiewicz. If not for a stellar tackle from behind by RB Greg Barbosa, Boston would have taken a powerful 21-3 lead into the locker room. Adams’s woes continued into the third quarter. Faced with third and five from his own five yard line, he attempted a fade to Avery Gonzalez down the left sideline, but CB Tom Hamblin won the jump ball, allowing the Captains to start just 11 yards from pay dirt. The Boston offense flopped, but settling for three pushed their advantage to 14 points. The Imperials would briefly make it a one score game when Adams redeemed himself by marching the offense down the field in less than a minute and a half before hitting WR Martin Hutley for a 28-yard touchdown pass. Much to the disappointment of the rowdy crowd inside the Imperial Coliseum, Boston extended the lead back to 14 just 9 minutes later when Russel Fraizer spun himself out of the grasp of a would-be tackler, and slashed his way into the end zone. The Imperials fought valiantly to get back into the game, but they simply ran out of time. A drive deep into Captains territory inside of the two minute warning came to an end when a pass went off the fingertips of TE Brian Kosbab on 4th and 8, and the Captains would never relinquish the ball. Boston fans were jubilant. For the first time in 36 years, their team was only one win away from the Victory Bowl. They had gotten there by defeating their most hated rival, possibly ensuring that one of the greatest players in the history of that franchise would retire without a ring, in the same season that saw their divisional boogeyman, Willie Krause, hang up his clipboard. 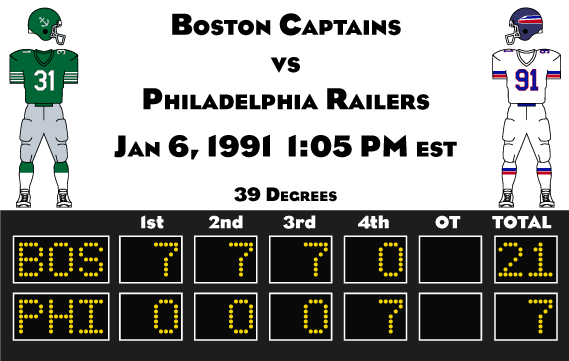 January of 1991 was a good time to be a Captains fan. Throughout the first quarter, both powerful offenses were largely held in check. In fact, neither team put up a single point until Detroit RB Johnny Hewitt pushed his way into the end zone from one yard out with 59 second remaining on the clock in the opening period. With this score, the Gladiators were suddenly unstoppable. In the next fifteen minutes and ten seconds, they racked up a 31-0 lead, with John Lewis throwing for two touchdowns, Johnny Hewitt adding a second on the ground, and Willie Sluder adding a field goal for good measure. When Houston got the ball back with under a minute to play before the half, they seemed content to simply run down the clock and use the break to try to find a way to get back into the game. Detroit, meanwhile, came out in a 7 DB formation to ensure that the Hurricanes couldn’t attempt a shot downfield. Tom Hudson took the snap, and handed it off to RB David Kennedy, who ran through the arms of two defensive linemen, put his head down and flattened LB John Schneider, and bolted into the secondary. He ran through a pair of attempted tackles by overmatched cornerbacks, and then threw such a brutal stiff arm at SS Eddie Kosakowski that the hard-hitting safety landed and stopped rolling a full seven yards away from where the impact took place. Kennedy trotted into the end zone, and brought the spectators back into the game so completely that, even with their team trailing 31-7, they were still cheering when the teams retook the field for the third quarter. The Hurricanes got the ball first, and cut the lead to 17 as Johnson carried the ball in from 7 yards out. 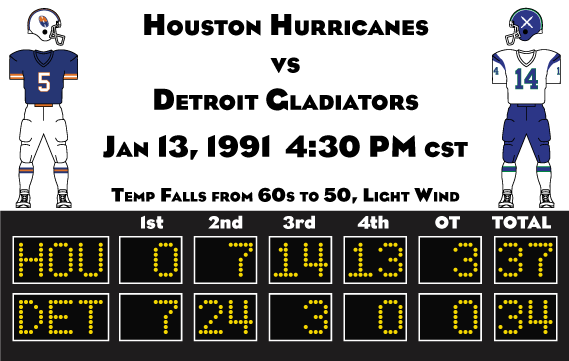 The Gladiators responded with a field goal, but from that point forward, there was little that they could do to slow down a Houston offense that was suddenly clicking. Tom Hudson threw a pair of long touchdown passes to RB Matt Cotten and WR Mark Ellison to end the third and begin the fourth, and suddenly, with 13 minutes to play, the score was 34-28, and Detroit’s 31-point advantage was down to 6. The realization that giving up another touchdown could cost them the game seemed to wake up the Gladiator defenders, as they finally kept the Hurricanes out of the end zone on their next drive, though a field goal cut the deficit to 3. Finally, with 1:13 to play, Houston K James Pickle was given the chance to tie it up with a 41-yarder. Pickle connected, and the game would go into overtime. With time no longer a factor, the Hurricanes could finally properly unleash the red-hot David Kennedy. They got the ball first, and repeatedly fed it to their bruising young RB, occasionally spelling him with the shifty veteran Matt Cotten. Just four minutes into the extra period, Houston had advanced all the way to the Detroit 13. Pickle came back out onto the field, split the uprights on the 30-yard attempt, and propelled his team to the semifinals for the fourth consecutive year. There could be some fireworks in Cincinnati next weekend. While the Guardians have enough talent in their front seven to keep Tampa RB Wayne Lee contained, their secondary is going to be absolutely outmatched by the pair of sophomore wideouts Deacon Cross and Sylvester McNeese. Conversely, the Bobcats simply do not have the personnel to disrupt the Reggie Hart to Vic Meredith connection. Expect both Hart and Tampa’s Bobby Davis to have big days, but the Guradians will come out on top, 35-27. 1989 was supposed to be Houston’s year, but a major injury to QB Tom Hudson derailed their Victory Bowl dreams. This year, Hudson is healthy, and the Hurricanes’ most feared rivals – New York and Detroit – are out of the picture. That being said, there is now a surprisingly strong Boston team standing between them and a trip to Hollywood (Florida, that is). Both teams have a lot of talent on both sides of the ball, but the difference between the teams is at the quarterback position. Boston has Jon Cliffe, a game manager whose job is to avoid blowing it. Houston has Tom Hudson, arguably the league’s best player. When the game is on the line, the field general won’t be stopped. Houston wins convincingly, 28-14.